Robert Luff & Co are delighted to offer the last remaining BRAND NEW Detached House being approx 145sqM, situated in the sought after location of Goring by Sea, just a short distance from the beach and sea. There are comprehensive local shopping facilities, schools, bus route all nearby. The mainline railway station that serves London, Brighton, Southampton & Portsmouth can be found in less than a mile. This superb new house has accommodation which comprises of four bedrooms, three bathroom/shower rooms - two being en-suite, living room, open plan kitchen/dining room with bi-folding doors onto the gardens, utility room, cloakroom/w.c. The property benefits from underfloor heating to the ground floor rooms and will have the appropriate 10 year new home guarantee. Internal viewing is highly recommended and is by appointment only. Wooden part obscured double glazed front door, storage cupboard housing fuse box, stairs to first floor. Low-level w.c, wall mounted vanity unit with inset wash hand basin with mixer tap over, hated towel rail, Karndean flooring, extractor fan, underfloor heating. Measurements to include built in units. Range of matching floor and wall Manhattan Paula Rosa units with Bosch appliances. This includes an inset one and half bowl stainless steel sink with mixer tap over and inset four point induction hob with down draft extractor adjacent, integrated dishwasher, fridge, chest height oven and microwave oven and wine chiller. Granite worktops with breakfast bar area and full height double glazed tri-fold doors to garden with three full height double glazed windows to side, further double glazed window to side, under counter lights and plinth lights, Karndean flooring and underfloor heating, access to utility room. Three double glazed windows to side and rear, HD satellite point with cable management, underfloor heating, double wooden glazed doors to kitchen/diner. Measurements to include built in units. Range of matching floor units, space and plumbing for tumble dryer and washing machine, cupboard housing underfloor heating manifold, granite worktop with inset stainless steel sink with mixer tap over, composite work top, two double glazed window to side and front, full height duble glazed door to side, Karndean flooring with underfloor heating. Double glazed window to front, access to shower room. Low-level w.c, heated towel rail, pedestal wash hand basin with mixer tap over, shower cubicle with thermostatic shower and glass screen over, tiled walls and floor, obscured double glazed window to front, extractor fan. Airing cupboard housing boiler and pressurised water tank, loft access with pull down ladder, obsured double glazed window to side. 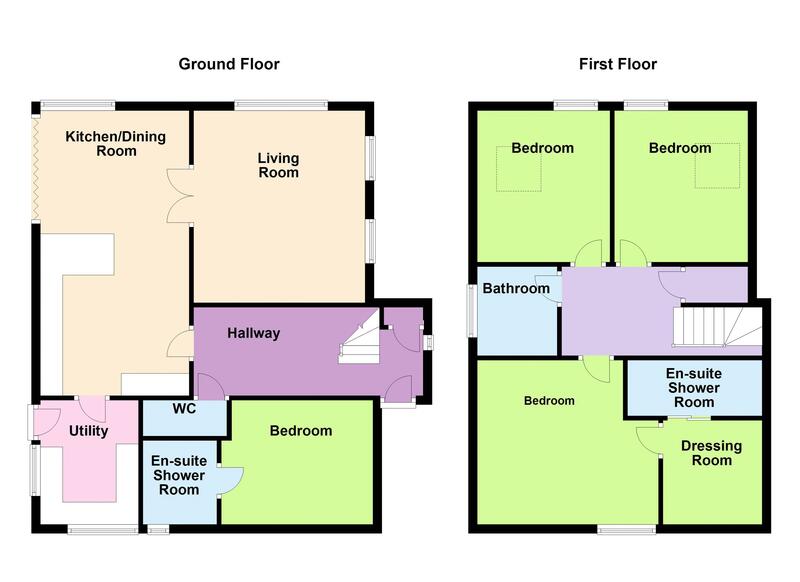 Double glazed window to front, double glazed velux to side, eaves storage, radiator, TV point with cable management, access to walk in wardrobe and en-suite. Double shower cubicle with thermostatic shower and glass screen over, low-level w.c, wall mounted wash hand basin with inset sink and mixer tap over. heated towel rail, obscured double glazed window to side, tiled floor and shower area, part tiled walls with wall mounted LED mirror. Double glazed winmdow to rear, double glazed velux to side, radiator, TV point with cable management. Double glazed window to rear, double glazed velux to side, radiator, TV point with cable management. PVC panelled bath with wall mounted controls and shower attachment, vanity unit with low-level w.c and moulded sink with mixer tap over, heated towel rail, tiled floor, part tiled walls, obscured double glazed window to side, wall mounted LED mirror. Resin finished drive with parking for multiple cars, access to garden, fenced surround. Mainly laid to lawn, Indian sandstone patio area, large out building with power and lighting, outside tap and sockets, flower and shrub borders, side access gate, wall mounted gas and electric meters.